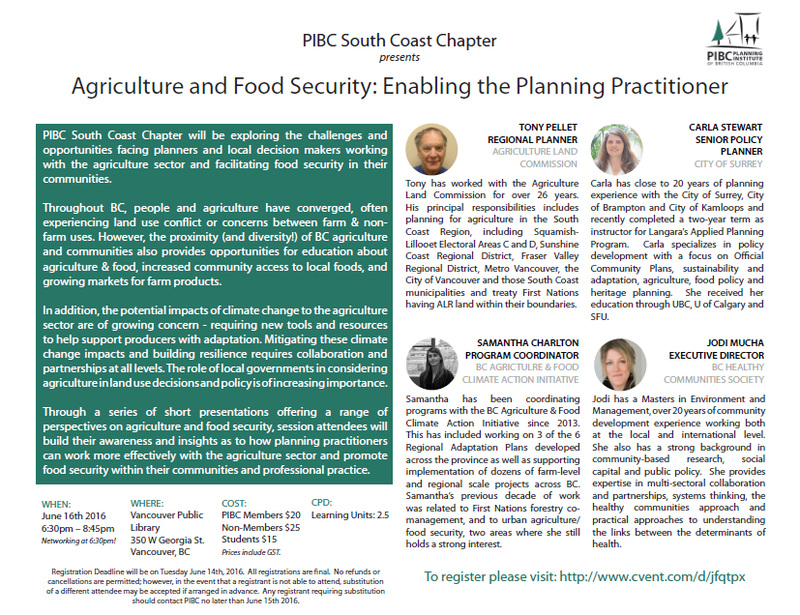 The PIBC South Coast Chapter will be exploring the challenges and opportunities facing planners and local decision makers working with the agriculture sector and facilitating food security in their communities. Throughout BC, people and agriculture have converged, often experiencing land use conflict or concerns between farm & non-farm uses. However, the proximity (and diversity!) of BC agriculture and communities also provides opportunities for education about agriculture & food, increased community access to local foods, and growing markets for farm products. In addition, the potential impacts of climate change to the agriculture sector are of growing concern – requiring new tools and resources to help support producers with adaptation. Mitigating these climate change impacts and building resilience requires collaboration and partnerships at all levels. The role of local governments in considering agriculture in land use decisions and policy is of increasing importance. Through a series of short presentations offering a range of perspectives on agriculture and food security, session attendees will build their awareness and insights as to how planning practitioners can work more effectively with the agriculture sector and promote food security within their communities and professional practice. All prices are subject to 5% Goods & Services Tax (GST). Registration Deadline will be on Tuesday June 14th, 2016. All registrations are final. No refunds or cancellations are permitted; however, in the event that a registrant is not able to attend, substitution of a different attendee may be accepted if arranged in advance. Any registrant requiring substitution should contact PIBC no later than June 15th 2016. See the poster below for more information (click to enlarge). Agriculture the new investment frontier?